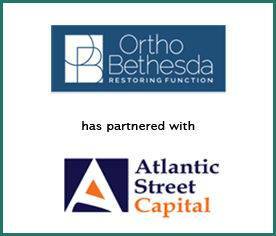 OrthoBethesda, a premier provider of orthopedic services in the greater Washington, DC region, has partnered with Atlantic Street Capital to create a dynamic orthopedic practice. OrthoBethesda operates four Centers of Excellence: Washington Joint Institute, providing treatment to patients with debilitating arthritic joint conditions; Washington Shoulder Institute, focusing on the demands of patients suffering from various shoulder-related ailments; Washington Spine and Scoliosis Institute, offering state of the art management of complex spinal conditions; and OrthoTraumaBethesda, providing advanced comprehensive care of orthopedic trauma cases. Provident Healthcare Partners (“Provident”) served as exclusive financial advisor to OrthoBethesda. The terms of the transaction were not disclosed. “We are excited to partner with Atlantic Street Capital to provide the highest level of orthopedic patient care. Provident was invaluable throughout this process. They took the time and did the research to understand our goals and they connected us with the perfect partner. They helped to guide us every step of the way to ensure a smooth transaction,” noted Dr. Sridhar Durbhakula, Co-Director of OrthoBethesda. Founded in 1965, the practice is a leading provider of comprehensive musculoskeletal care to patients in the greater Washington, DC market. OrthoBethesda’s board-certified orthopedic surgeons, all fellowship-trained in their specialties, are respected for their expertise in treating problems relating to bones, joints, extremities, hands, feet, and the spine. This includes such disease processes as arthritis as well as fractures, tendon and ligament injuries, and sports-related concerns. The practice also employs a team of physical therapists and therapy aides in addition to a broader team of licensed clinicians. Visit http://www.orthobethesda.com/ for more information. Provident is the leading investment banking firm specializing in merger and acquisition advisory, strategic planning, and capital formation for healthcare companies. The firm has a comprehensive knowledge of market sectors and specialties, including the orthopedic sector. Provident also has unsurpassed experience and insight into the M&A process, which includes working with a number of buyers such as private equity firms and strategic groups. For more information, visit www.providenthp.com.